For over 40 years Nick Hoffman had hair that covered his face and reached the middle of his back. He had always said that he wouldn’t cut it off not even when offered £2000. This became a bit of a running joke at The Buff amongst his drinking pals and pub regulars, which then extended to the other local drinking hole in Orpington, The Queen’s Head. Des Doran then put it to Nick and the other pub regulars that if Nick was to lose his mane he should do it for charity and so the fundraising began. Patrons of both pubs including the managers and bar staff started collecting money to fund Hoff’s Haircut. St Christopher’s would like to say a massive thank you to Neil Craddock who took up the role of unofficial secretary and treasurer and John Hillman who took on the promotion of the event at The Queen’s Head. 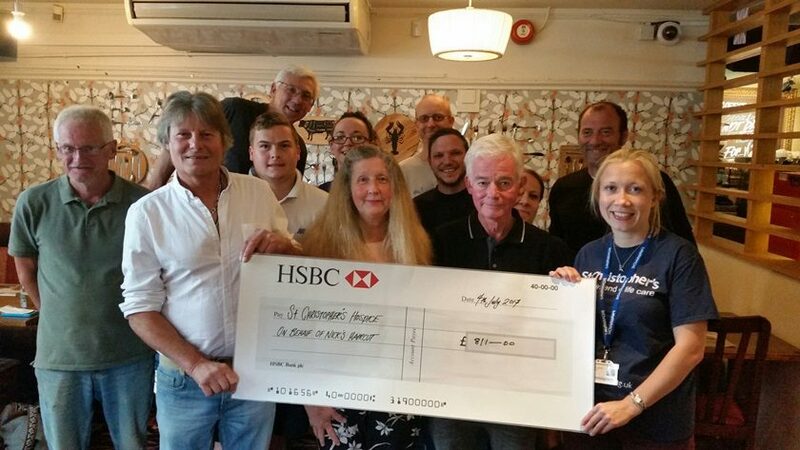 We would also like to thank Charlene, the manager of the Buff, and both Mike and Harriet at The Queen’s Head for all they did in helping the group raise an amazing £811 for the Hospice. “St Christopher’s simply cannot do what it does without local support”, said Fundraising Manager Sarah Coughtrie when thanking everyone for their efforts.